Since we know TED speakers love to read, we asked them: What book could you not stop reading? Here are their eclectic picks, ready for sticking in your carry-on or for gifting. This is the first installment in a detective series set in ancient Rome. This book will make you realize crime, corruption, cops and crime fighters are not a new concept. Davis places her modern crime/detective stories in a well-documented, accurate, historical background. Her charming characters live realistic everyday lives, fighting crime back in the old Rome of the Caesars. It’s a fun read. This globetrotting novel follows the life of an awkward female “natural philosopher” born in 1800, providing a window into the development of science as a profession in the 19th century and dealing with the slings, arrows and random events that mark all our lives. It’s a great read for anyone who wonders how we learned about the evolving world and the experience of being a scientist — in thrall with discovery, analytically minded and determined to overcome setbacks. Because it’s by Elizabeth Gilbert (TED Talk: Your elusive creative genius), it’s also an amazing read! Often people from the “outside” see things differently and offer a fresh perspective. Hazelton, an agnostic Jew, writes about the prophet Muhammad from a nonjudgmental stance and with historic deep knowledge in a way that offers an inspiring perspective into its first prophet and the time when Islam was born. I could connect to the human being Muhammad, and for me, as a Muslim woman, this book made me reconnect with my own identity. I don’t generally gravitate toward fiction, but this collection of short stories, set in a variety of compelling places and time periods, is so creative and rich, it’s been really fun to read. I was quickly drawn in by the vivid settings and characters and loved the unpredictable storylines. Reading or re-reading this book should be compulsory, when so many of the issues it touches on — manipulated news, unwanted surveillance — are highly resonant today. I re-read it this year before taking part in June in a live, nonstop reading of the book at the University of London’s Senate House, the building that inspired Orwell’s chilling Ministry of Truth. The book was just as wonderful and yet terrible as it was when I read it at age 15. Patitucci did my very favorite thing: write characters and create a world so lush, vivid and rich that the story sucked me in and swept me away to another land until I reluctantly turned the very last page. This novel is a page-turning look at a particular place and moment in history — Spain in the 1600s — and a thought-provoking exploration of what it meant to be a dwarfess when they were considered property but also magical beings. I also loved all the questions it raises about the nature and stability of power. One place that really put the continent of Africa on the map is the legendary Tsavo National Park in Kenya. This nonfiction account starts in 1898, when workers who were building the East African Railway Line were attacked by man-eating lions. These lions became infamous, and hunting them down became a mission for virtually the entire British, Indian and African team working on the railway, because construction came to a halt. The lions attacked at night like ghosts; in fact, some of the people came to believe they were being attacked by ghosts. Colonel Patterson finally managed to shoot the lions, and the story became the basis for this book and the film that followed. This will make you want to visit the mighty Tsavo and hear more stories about this land of wonder. I really enjoyed this fast-paced novel that focuses on strong but flawed female protagonists set in two different time periods: World War I and post-World War II. This fictional account of women spies blended a description of German-occupied France with the characters’ gritty personal stories, and it was fascinating to read. Military fiction is quite a popular genre, but there’s no one better than Reilly to take you on a rollercoaster ride. Set in Antarctica and part of a series, Ice Station is like a Hollywood action movie in a book. It’s crazy fast paced and has a tough-as-nails hero, and it’s one of those reads that make you forget you need to eat and sleep. If you like action flicks, you need to discover this book. Just make sure to start reading on a slow day, because you won’t do anything else until you finish it. This is one of those books that I’ve continuously thought about and quoted back to other people ever since I read it. Ansari worked with a sociologist to write this well-researched and provocative look at the history of romance, courtship and marriage, putting into context the fantastic amount of pressure that our current ideas have put on our own love lives and partners. It’s a must-read for anyone who is dating, married or thinking of ever doing either. The Ideas Industry is a fascinating description and critique of how ideas are formed and lobbied for, and how they gain influence in a world increasingly populated by Silicon Valley millionaires. This book hits especially close to home for TED audiences, in an important but not particularly flattering sense. This book, which is written in French, is a poetic essay on the myths of Africa’s decolonization. It highlights modern Africa’s mutations and the realities of neocolonialism and puts it in today’s global context. This is the most disturbing political book I’ve read this year. Based on travels through key European centers, Murray weaves a tale of uncontrolled immigration, failed multiculturalism, systemic self-doubt, cultural suicide and disingenuous political leadership. Accurate, insightful and devastating, with applicable lessons for countries on both sides of the Atlantic. This alarming book is about the generation born after 1995 who’ve grown up with cell phones, Instagram and the rest. Twenge’s thesis, amply documented by research, is summed up in the book’s subtitle: “Why today’s super-connected kids are growing up less rebellious, more tolerant, less happy and completely unprepared for adulthood.” It’s an interesting and important read, especially for those working in the technology sector. Along with Volume 1, which I recommended in my suggestions for TED’s 2017 summer reading list, these are the best bedtime books you’ll ever read. It will help girls — young and old — to dream bigger, to be confident, and to be inspired. This is a story of a lost child who lives in a cemetery and is raised by ghosts. This dark and twisted tale allows you to look past what’s on the surface and to realize there’s always more than meets the eye to everyone we meet. Here We Are is a fascinating mix of planetary facts, stories and bits of advice, packed into a fantastic illustrated book that the author addresses to his infant son. These “notes” examine our planet and our humanity with hope, encouraging readers of all ages to reconsider how they look at our world and our future. This book is the first installment in the 10-volume “Wicked Witches of the Midwest” series. It’s full of laugh-out-loud humor, mystery, fantasy and romance. It’s aimed at girls, but I think it’s just hilarious. If you like urban fantasy, detective stories and witty dialogue, Lee is an author you should give a chance to. This charming and award-winning children’s book details the adventures in the day of the life of cat-and-dog best friends Hondo and Fabian. The beautiful illustrations (also by McCarty) visually enhance the sweet story, making it perfect for bedtime. I read parts of this novel with my daughter, and what I read was so compelling that I picked it up again one weekend and read the whole thing in one sitting. It’s a great reminder of the beauty in all people, the ability for good to prevail and the compassion that middle schoolers can exhibit for each other. It gives me hope for this next generation and this nation. Some of our nation’s leaders could benefit from reading it. This book is part of a brilliant series for children (and parents) who love to be creeped out. It’s set in London when the city is experiencing an outbreak of ghosts who kill people if they come into contact with them. The catch: only children can see them. These stories features the kid-run ghosthunting agency, Lockwood & Co. — it’s led by the talented 14-year-old heroine Lucy Carlyle and charismatic teen Anthony Lockwood. Their job is to destroy ghosts by finding the objects in the world of the living that spirits are attached to. The social implications of the ghost epidemic are almost as chilling as the cases the agency takes on — almost. It’s a gripping read and a great intro to dystopian literature and social dynamics. You’ll want to sleep with the lights on, even after you’ve exhausted yourself by reading guiltily ahead late into the night. I’ve been reading the Little House series aloud to my children, and this fourth installment, in particular, is full of fantastic landscape descriptions and harrowing tales: Pa getting lost in a blizzard, Laura leading Nellie Olsen into a leech-filled eddy on the creek, and locusts! These are the parts of the books that I remember most from when I was little and my father read the books to me; it’s been great to revisit them. I loved reading the Little House series as a child, because it made self-sufficiency sound cool and frontier life sound cozy. I’m now reading the sixth book in the series as an adult to my seven-year-old, and I can think of no other book where the experience of the adult reader and the child listener are so starkly opposite. Children may love the notion of a snug home on the open prairie, but the parent will be gripped by the enormous peril that the Ingalls family is in as they’re snowed under for eight months without enough food or firewood. You may also consider the capabilities of your child differently when you read the part about how homesteader Almanzo Wilder — just 17 years old at the time — saves the entire town from starvation. This manifesto/memoir is a reminder of how women are expected to succeed at two full-time jobs — the paid one outside the home and the unpaid one at home — and how we need to be realistic about our expectations in order to be successful at both. This is one of those must-reads for any business reader, especially people who are interested on lean manufacturing. Insightful and full of a-ha moments, it’s a business book that’s cleverly disguised as a novel. Surprisingly easy to read, it’ll rock your management self and make you see your company and your organization in a new light. It covers productivity, strategy, change management — you name it! This is technically not a book about moments, despite the title; instead it’s about what creates powerful experiences and memories. It’s really helped me think through planning events in business — and in planning experiences with my family. I met Johnson and Smith, two amazing men, when I was writing my book about stopping sexual harassment and gender inequality. Through their eyes, I saw that these could be men’s issues too. Here, they provide the perfect guidebook for helping men be the mentors that women need them to be — and show us all how this is a fight that men and women need to engage in together. Dr. Mueller’s research on how we react to new and innovative ideas has had a fantastic impact on her field. In this book, she outlines a plan for overcoming the resistance to change. I’ve read the book many times, and sometimes I just re-read a section out of it. It’s on my bedside table and in my Kindle, and I have found it a huge support during various phases in my life in the last 15-plus years. Most life journeys have been written by and about successful men. This book helps you understand the deep patterns in the journeys of successful women — showing what drives us to success but also to over-exhaustion — and how we can integrate masculine and feminine forces in our lives. This lively book for a popular audience covers our current understanding of all the major mass extinctions in the history of life and what they collectively mean for our future. Brannen interviewed paleobiologists, geologists and other investigators, tagging along on fieldwork and visiting their labs. As a result, it’s part travelogue, part hard data and part sociology of science, resulting in a deep and multifaceted view of the state of the world. It’s also fun. I recommend this book in part because Doudna (TED Talk: We can now edit our DNA but let’s do it wisely) co-discovered the CRISPR technology, and she provides fascinating insights about what went into it. At the same time, the book is a unique look at how CRISPR is changing science. It’s written in a very accessible way that a broad audience will understand and enjoy. I’ve read this book many times, since Fortey is a master on writing about science in a very entertaining way. Many times, I’ve just re-read the first chapter to have a sense of what it’s like to explore new worlds and places like Indiana Jones. I recently picked up Foolproof at a local bookstore in San Francisco, and I simply couldn’t put it down! In this wonderful book — using Sudoku, Hilbert curves, chaos, π and much more — Hayes shows us the colorful, creative and imaginative side of mathematics. Seashells have been an object of fascination throughout history, used as jewelry, currencies — not to mention as food. The book is easy to read and filled with fun science facts and studies. It’s a good balance of complex and playful language. This eloquent and lucidly written book is a favorite of mine. It illustrates how science can solve some of the most vexing problems of the time. In this particular case, it was how to know the precise longitude of where one might be anywhere on the face of the Earth. This knowledge was of vital importance to seafaring nations — it made the difference between finding safe harbor or being shipwrecked. This problem was so urgent and so impenetrable that in the 17th century, it spurred the British Parliament to pass the Longitude Act of 1714. It promised a prize of 20,000 pounds (or millions of dollars today) for a solution to this problem. This book is a gem and a joy to read. I just finished this excellent popular science book by talented science journalist Wadman. It’s an extraordinary story about a little-known strain of cells called WI-38, which were derived from tissue from an aborted fetus in 1962. These human cells went on to be used by labs around the world — and they’ve been fundamental to the production of life-saving vaccines against rubella and other common diseases. I’m biased in favor of the book, because Wadman and I wrote our books at the same time, and we became trans-Atlantic science-book-writing partners who helped each other through many low points. But her book really is gripping: it explores practices in medicine that would be unthinkable today and skillfully synthesizes a huge amount of research into a gripping and important narrative. Brown first came to my attention through her TED talk (The power of vulnerability). I was struck by the courage it took her to be so honest — to acknowledge that being vulnerable doesn’t mean being weak. In her newest book, she again shatters the myth that having the courage to stand alone doesn’t isolate us. Instead, it brings us into a fuller experience of community. This message meant a lot to me after I was forced by take a stand by myself. Ikeda is the president of Soka Gakkai International Buddhist Organization. Drawing on the lives of individuals, this book speaks to the challenges and opportunities of aging. Its perspective is that the third stage in life is like a third youth. Youth does not fade with age, as long as we refuse to be defeated, continue to learn and grow with a positive attitude, and enjoy the spirit of challenge. This book inspires readers to seek an inner revolution throughout their lives. This incredibly insightful book details the underlying motivations and behaviors of those with narcissistic personality disorders. It also describes the interpersonal relationship characteristics between individuals with NPD and others at work and at home. In a world filled with increasing self-absorption, it’s is a terrific read. I was inspired by Smith (TED Talk: There’s more to life than being happy) after meeting her at the 2017 TED conference. There is so much of American culture that’s reliant on happiness, and her book is a good reminder that we might be focusing on the wrong things and perhaps meaning is a better focus for us. What role do unconscious biases play in how we make decisions when we buy, think, vote, judge and convict? What we don’t know about what we believes shapes much more about our lives and our actions than we realize. The author does a great job of educating readers about the role of unconscious bias in a page-turning, interesting way. I believe that this is a very timely book for anyone puzzled by our current political environment. It provides an excellent glimpse into the people, politics and maneuvering that surrounded the creation of our current system of government. More than that, it shows that politics has been a bruising endeavor since our country’s earliest days. An utterly readable, intimate examination by Gay (TED Talk: Confessions of a bad feminist) about living as a fat black woman. It’s impossible to put down and impossible to read without being moved and vicariously enraged. This is the true story of Itzler, who decided to invite a Navy SEAL to live with him and his family for a month — and then tried to keep up with his physical regimen. This book teaches you that if you push hard enough, there is more to find within yourself. This memoir of life before, during and after the Holocaust was written by a woman who went on to become a leading scholar of comparative literature. Kluger is a feisty feminist, unafraid to speak her mind, and full of piss and vinegar. This is an iconic memoir of a year in Auschwitz by an Italian Jew. Deeply psychological and insightful, it is a breathtaking analysis of what becomes of people forced into a setting that is designed to destroy one’s inner being and life. This book by the late Nobel Peace Prize winner, a real icon for conservation in Africa, has a special message. She inspires many Africans, especially young girls, to keep pushing for a better life. This fascinating book highlights the troubled past of a continent that has lots of potential and explains how Africa can use its culture, nature and self-belief. It is a magnificent biography of British painter Sickert (1860–1942), whose work followed the moment when modernism is born. He didn’t just live through the period; modernism lived through everything he does. He was like an early David Bowie, utterly committed to his art and offering us an alternate perspective on the world. 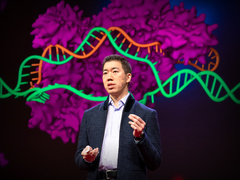 Biologist Wilson (TED Talk: My wish — build the encyclopedia of life) tells his story and recounts his journey as a young scientist in pursuit of the wonders of the natural world. You’ll become inspired by his personal letters and embark on your own journey of exploration. This work of nonfiction is a beautiful story that takes place in Joal, a Senegalese fishing village facing the challenges of overfishing and climate change. With humor and poetry, the reader is taken on a cultural voyage full of myths, humanity and love. I love this novel because it helps you explore the world of senses through Mexican food. It’s about the passion, love and desire connecting two characters that never can be. The fields of mathematics and art are deeply and profoundly interconnected. This beautiful book is an irresistible and impressive tour through mathematically inspired art, the philosophical force of seeing things from different perspectives, and the essence of mathematics. I can’t help but recommend this last book by Salter, who died this year. A man comes back to New York from World War II to face the unremarkable cruelty of normal life — melancholy, the pursuit of love and passing seasons. It’s all described in language that is alive, elegant, precise and satiating. This is a book you could read over and over for the rest of your life, at the very least for its graphic beauty. Sis animates a 12th-century epic poem by Sufi mystic and poet Farid ud-Din Attar that takes readers on a spiritual quest through adversity, uncertainty and human weakness through the metaphorical experience of birds. I have read this book many times due to the fine-quality prints of not only the most known Impressionists, but also from lesser-known artists whose paintings are as beautiful as those of the masters. It gives a good and interesting story on how this movement begun, grew and evolved into post-impressionism. Through the years I have later “chased” these paintings in museum all around the world to appreciate what I first saw in the book.